Just How Big Is Google Reader? Google’s RSS reader was nothing to write home about when it first launched in October 2005. But the new version, released late last year, has won it accolades and legions of new fans. More than a few people have recently called it the best RSS reader, hands down. But it’s hard to know exactly how popular it’s gotten. Feedburner doesn’t track it yet, so we can’t compare the subscriber numbers to other readers. We’ve noticed a significant jump in referrals from Google Reader, though. Enough to suggest that it is as large or larger than Bloglines already. Hitwise says different. In a post tonight comparing the web based readers, they put Bloglines and Rojo firmly ahead of Google Reader. Generally Hitwise seems to be on the money, but something doesn’t add up. One semi-obvious explanation is that Google Reader requires far fewer page refreshes than Bloglines. 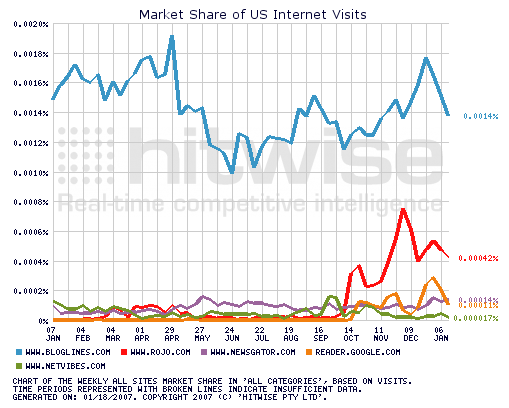 This would decrease their page view numbers, but not visits, which is what Hitwise tracks. We may need to wait until Feedburner starts tracking Google Reader directly as well to triangulate its true popularity.